On the first visit you will meet the Somnowell Chrome Practitioner. The Somnowell Chrome practitioner will take a full history, undertake an extra oral inspection of the face, soft tissues and jaws. Then an intra oral examination is undertaken to include assessments of soft tissues and the teeth. A brief dental examination, periodontal assessment, dental health and mouth inspection will be undertaken. 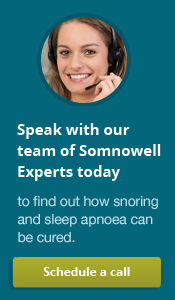 The causes of snoring and sleep apnoea are discussed and explained. The range of management modalities for snoring and sleep apnoea are discussed, along with the indications, merits and limitations. The following recordings can be undertaken in the same appoinment, or at a second appoinment. Detailed and accurate impressions of the teeth. Record of the forward postured bite. This will determine the forward jaw resting position. The clinical records i.e. impressions, bite recording, and face bow are sent on to the specialist laboratory. The laboratory casts two sets of high quality, hard stone models. The stone models are then surveyed. The surveyor helps the technician to identify possible positions for the appliance components. The laboratory technician designs a bespoke Somnowell Chrome, since no two mouths are the same and each appliance must be tailor-made. An agreed design is recorded in the laboratory. The technician then sets up the previously surveyed models on a semi-adjustable articulator. The articulator enables simulation of the jaw positions and jaw arc of opening plus other jaw movements. The technician chooses the position of the piston tube attachments. The technician follows the prescription and constructs a wax Somnowell Chrome appliance. This wax model is then cast in investing stone and, using the “lost wax” technique, the cast chrome cobalt appliances are constructed. The Somnowell Chrome now fully constructed is cleaned and re-tried on the unused stone models to ensure that the appliance will fit. Any minor adjustments are made at this time. The Somnowell Chrome is cleaned, disinfected and where appropriate sterilised in an autoclave, packed, and dispatched to the practitioner. The practitioner places the lower and upper parts in place. The patient practices opening and closing, and other jaw movements. The jaw joints and teeth are of special interest at this stage. If necessary the practitioner can make slight adjustments to the Somnowell Chrome. The patient practices assembly, placement and removal in the presence of the practitioner. Each appliance comes with written instructions on Somnowell Chrome assembly, wear, cleaning, care and management of any problems, a tool kit to enable device adjustment and a device to assist jaw resettling following the wearing of the Somnowell Chrome along with a Somnowell Chrome storage case. Follow up's periodically, with the dentist are advised, to ensure your device continues to fit well. This is not included in the package of care and additional dental fee's and or laboratory fees are to be expected.